Kirby! That’s a name you should know. He’s the star of the show. Okay, while Kirby hasn’t had an anime outing in many years, he’s still lighting up the sky from Popstar (and in many cases, outer space) with frequent releases that always take what worked in the series and tweak it to make it even greater. However, does this formula still shine bright for the latest entry in the series, Kirby Star Allies? I wonder if Dedede has guards watching those towers. First off, it’s immediately noticeable that Kirby Star Allies is beautiful, as it should be. After all, this is the first traditional Kirby game to be designed in HD as Kirby and the Rainbow Curse was a spin-off, as gorgeous as its claymation-aesthetic was. As beautiful as Star Allies is, it’s held back by being 30fps, which is at least consistent, especially since things can get hectic. While four-player co-op is not a new feature to the series thanks to Kirby’s Return to Dreamland, it is the first time these allies can be CPU-controlled since Kirby Super Star Ultra in 2008, which seems to be the inspiration for helpers in general. 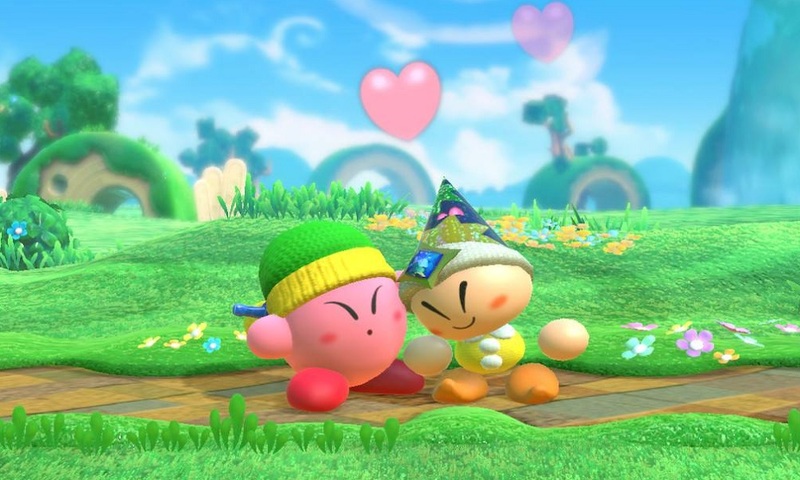 This time, instead of inhaling an opponent and giving up that ability to create another helper, Kirby can throw “friend hearts” at certain enemies to brainwash befriend them. Players controlling these helpers can also throw friend hearts to change to a different ability. This fixes one of the largest issues the Super Star releases had, where the second-player had to either rely on Kirby giving up his ability or blowing themselves up and hoping the enemy holding the power they want doesn’t die leaving their self-sacrifice in vain. Kirby guide to throwing your friends a party. Step 1: Throw your friends! These helpers have another use with the introduction of the new friend-ability system. Each ability will have a secondary effect that can only be used to its potential with another friend around. If you’re holding up while holding a sword, ninja blade, or hammer, or even a Yo-Yo, players with an elemental ability such as fire, ice, or plasma can imbue that element into your weapon, creating an insanely powerful tool of destruction. These weapons can also be used to solve different puzzles, that are unfortunately spelled out for you if you have tips on. Thanks for spelling it out, want to take control of Kirby for me next time, too? This is where the aforementioned chaos comes in. For the most part, CPU helpers behave well. They jump onto the puzzles when they are close enough (as indicated by an exclamation mark above their heads, they will imbue your weapon in order of which player slot they are in, and they’ll go after specific enemies vulnerable to that element. Unlike Kirby Super Star, they know when to not attack, as pulling out a friend heart will stop their carnage. However, get these friendly helpers into a room with a boss? Your boys-night-out group just became a goon squad. Absolutely savage gang of ruffians roasts poor innocent sentient tree. As a result of your blood-lusting buddies, bosses become even easier than they were in past games. Kirby games always had the trouble of having simple bosses, but there are some bosses that don’t require you to do anything if you have a full team to the point of it being less enjoyable. Of course, you could make your helpers go away, but that shouldn’t be a necessary fix to this problem. This is a shame because some of the bosses have interesting designs and it would have been cool to experience their entire moveset the first time I faced them. The mid-bosses proved to be more challenging than some of the late game bosses. At least Waddle Dee is happy with the painting ability of his ally. Another common complaint is the length of the game, where its main story can be completed in a few hours. However, I’ve always found that the main game isn’t actually the meat of what’s available. Similar to almost every traditional Kirby game since Kirby’s Adventure in 1993, there are additional modes after you complete the main story, which I consider to be the best part of Star Allies. However, to avoid spoiling the contents of these modes, I will save that for another day. There is an issue in that there is only one main collectible per level (rainbow puzzle pieces) instead of the standard several collectibles present in past games such as Planet Robobot and Triple Deluxe. The focus on the multiplayer aspect of Star Allies does create an issue with level design. Each level is designed to have partners with you, creating fewer tight corridors where you would normally find secrets in the previous 3DS entries. But while it’s disappointing for single-player preferred players, the multiplayer aspect is well done. There are even switches to secret levels! Finding different friend abilities is exciting, and there are even unique mixes such as being lifted up by someone using the psychic ability as a rock. These powerups are used to solve unique puzzles and can be even more effective against already underwhelming bosses. In addition, having your friends cooperate with you to overcome a goal is about as frustrating and equally hilarious as herding cats. There are a few new abilities added such as Staff, where players can even pole-vault their way through the map, Spider, which can be used to trap enemies or bounce higher with friends using a trampoline-web, even Cook has more uses when a friend heart is used on Chef Kawasaki. Sadly, only the ally can use his other abilities. Fan-favorite abilities long absent also return including cleaning (known as broom in Kirby’s Dreamland 3), suplex, and yo-yo (my personal favorite). Suplex and yo-yo remain relatively unchanged from Kirby Super Star with yo-yo receiving a new walk-the-dog move, but cleaning now has a different moveset where the animal buddies from Kirby’s Dreamland 2 and 3 appear. Try getting your friend to cooperate to get this move to work. I dare you. This isn’t the only time the animal buddies will appear in this game. In each world, there is a single Dream Sanctuary. Here, players can pick up the Dream Staff and receive a special friend to join you on your adventure at random. Currently, these characters are King Dedede, Meta Knight, and Bandana Waddle Dee. Over time, Kirby Star Allies will be receiving more Dream Friends including Rick & Kine & Coo, Gooey, and Marx. This opens up the possibilities of a wide variety of characters to be released later on. There are sub-games as well that are sadly lackluster compared to the great ones in Triple Deluxe and Planet Robobot. Despite being too simple, this doesn’t mean that I didn’t have a great time with Star Allies. The new abilities were fine, the old ones were tuned to near perfection, the visuals were beautiful, and the music was memorable. There was never a single time I felt like I’d dread replaying a certain part, as the game was willing to work with my pace when I found an ability I liked. There are special friend transformations. One of them is a rolling wheel of death. The most difficult part about reviewing this game is that I can’t discuss my favorite aspects of this game in the review. As you can guess, they come later after the curtain call. But for now, I can tell you that Kirby Star Allies is a great game for inexperienced players, players with friends available for couch co-op, and fans itching for more Kirby goodness.